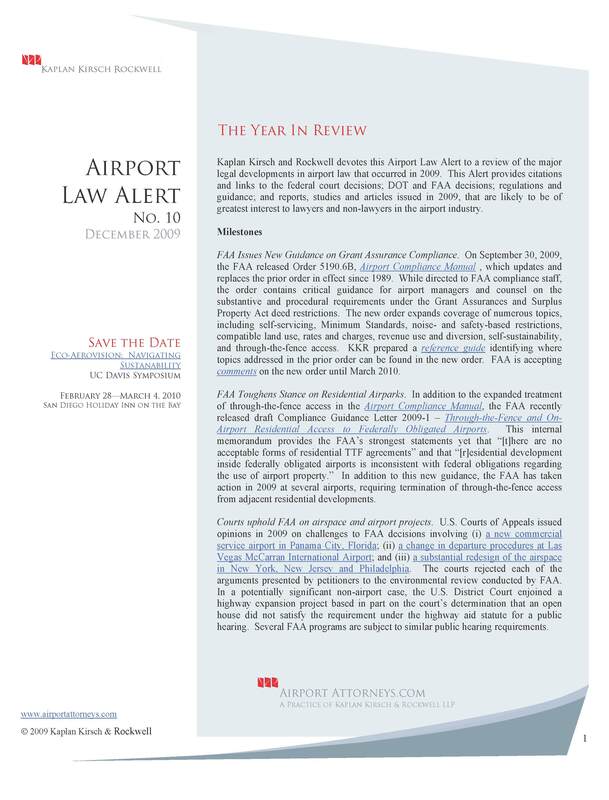 Kaplan Kirsch & Rockwell devotes this Airport Law Alert to a review of the major legal developments in airport law that occurred in 2009. This Alert provides citations and links to the federal court decisions; DOT and FAA decisions; regulations and guidance; and reports, studies, and articles issued in 2009, that are likely to be of greatest interest to lawyers and non-lawyers in the airport industry. FAA Issues New Guidance on Grant Assurance Compliance. On September 30, 2009, the FAA released Order 5190.6B, Airport Compliance Manual, which updates and replaces the prior order in effect since 1989. While directed to FAA compliance staff, the order contains critical guidance for airport managers and counsel on the substantive and procedural requirements under the Grant Assurances and Surplus Property Act deed restrictions. The new order expands coverage of numerous topics, including self-servicing, Minimum Standards, noise- and safety-based restrictions, compatible land use, rates and charges, revenue use and diversion, self-sustainability, and through-the-fence access. Kaplan Kirsch & Rockwell prepared a reference guide identifying where topics addressed in the prior order can be found in the new order. FAA is accepting comments on the new order until March 2010. FAA Toughens Stance on Residential Airparks. In addition to the expanded treatment of through-the-fence access in the Airport Compliance Manual, the FAA recently released draft Compliance Guidance Letter 2009-1 – Through-the-Fence and On-Airport Residential Access to Federally Obligated Airports. This internal memorandum provides the FAA’s strongest statements yet that “[t]here are no acceptable forms of residential TTF agreements” and that “[r]esidential development inside federally obligated airports is inconsistent with federal obligations regarding the use of airport property.” In addition to this new guidance, the FAA has taken action in 2009 at several airports, requiring termination of through-the-fence access from adjacent residential developments. Courts uphold FAA on airspace and airport projects. U.S. Courts of Appeals issued opinions in 2009 on challenges to FAA decisions involving (i) a new commercial service airport in Panama City, Florida; (ii) a change in departure procedures at Las Vegas McCarran International Airport; and (iii) a substantial redesign of the airspace in New York, New Jersey and Philadelphia. The courts rejected each of the arguments presented by petitioners to the environmental review conducted by FAA. In a potentially significant non-airport case, the U.S. District Court enjoined a highway expansion project based in part on the court’s determination that an open house did not satisfy the requirement under the highway aid statute for a public hearing. Several FAA programs are subject to similar public hearing requirements. Numerous Reports and Studies Published in 2009. Both the Government Accountability Office and Transportation Research Board continue to publish extensively on airport- and aviation-related topics, including hot topics such as the environment and security. In particular, TRB issued numerous project reports, syntheses and legal research digests in 2009 through the Airport Cooperative Research Program. Citations and links to notable reports and studies are provided below. As in most years, it is difficult to gauge whether the reports, individually or collectively, will prompt or result in any particular legal development or reform. Congress Yet to Act on FAA Reauthorization. The U.S. House of Representatives approved the FAA Reauthorization Act of 2009 in May. In June, Senator Rockefeller introduced a related bill in the U.S. Senate, the FAA Air Transportation Modernization and Safety Improvement Act (S.1451), which was approved by the Commerce, Science and Transportation Committee in July. Once approved in the Senate, differences with the House version will have to be resolved by a Committee of Conference. FAA programs continue to be funded through a series of extensions. The current extension expires on December 31, 2009. An additional three-month extension is imminent, as it appears virtually impossible for the Senate to debate and vote on a bill by the end of December. Alaska Airlines, Inc. v. DOT, 575 F.3d 750 (D.C. Cir. 2009) (court upheld portions of DOT’s decision on rates and charges imposed by the City of Los Angeles on airlines at Los Angeles International Airport, vacated portions of DOT’s decision, and remanded the matter to DOT for further proceedings). Bowling Green v. Martin Land Development Co., 561 F.3d 556 (6th Cir. 2009) (court held, in accord with other circuits, that Section 40103 does not confer a private right of action). City of Las Vegas v. FAA, 570 F.3d 1109 (9th Cir. 2009) (court rejected the City of Las Vegas’ challenge to a change in departure procedures at Las Vegas McCarran International Airport). County of Rockland v. FAA, Case No. 07-1363 (D.C. Cir., June 10, 2009) (unpublished opinion) (cert pending) (court denied twelve consolidated petitions challenging the FAA’s decision to redesign the airspace surrounding airports in New York, New Jersey and Philadelphia). Georgiacarry.org v. City of Atlanta, Case No. 08-15571 (11th Cir. 2009) (unpublished opinion) (court affirmed a decision of the U.S. District Court that, in effect, permits the continued application on a longstanding ban on firearms within public airports in Georgia). Highway J Citizens Group, U.A. v. DOT, Case No. 05-C-0212 (E.D. Wis., Sept. 14, 2009) (court granted summary judgment to plaintiffs challenging highway expansion project, based in part on finding that open house held by FHWA did not satisfy public hearing requirement of the Federal Aid Highway Act). Natural Resources Defense Council v. FAA, 564 F.3d 549 (2d Cir. 2009) (court denied petitioners’ challenge to the FAA’s approval of a new commercial service airport in Panama City, Florida). Rectrix Aerodrome Ctrs., Inc. v. Barnstable Municipal Airport Comm’n, 632 F.Supp.2d 120 (D. Mass 2009) (court granted summary judgment for defendant airport sponsor, rejecting plaintiff’s RICO, Equal Protection and First Amendment claims). Southwest Airlines Co. v. TSA, 554 F.3d 1065 (D.C. Cir. 2009) (court affirmed most aspects of TSA’s methodology for collecting aviation security infrastructure fees). Township of Tinicum v. DOT, 582 F.3d 482 (3d Cir. 2009) (court upheld DOT’s determination that a “privilege fee” imposed by Tinicum Township, Pennsylvania, for the use of Philadelphia International Airport violated the Anti-Head Tax Act). United Air Lines, Inc. v. Regional Airports Improvement Corp., 564 F.3d 873 (7th Cir. 2009) (court reversed bankruptcy court’s valuation of terminal space at Los Angeles International Airport). United States v. Fofana, 620 F. Supp. 2d 857 (S.D. Ohio 2009) (court suppressed evidence on grounds that search was conducted to look for evidence of criminality unrelated to transportation security). Final Decision on the Application for a Curfew, Bob Hope Airport, Burbank, CA (Oct. 30, 2009). Kaplan Kirsch & Rockwell represents the City of Burbank. Director’s Determination, Johnson v. Goldsboro-Wayne Airport Auth., FAA Docket No. 16-08-11 (Oct. 9, 2009) (concerning allegations of various grant assurances in connection with denial of request to conduct commercial self-service fueling). Director’s Determination, Asheville Jet, Inc. v. Asheville Regional Airport Auth., FAA Docket No 16-08-02 (Oct. 1, 2009) (concerning allegations of economic discrimination and grant of an exclusive right in connection with alleged disparate treatment of competing fixed-base operators). Final Decision and Order, 41 North 73 West, Inc. dba Avitat v. County of Westchester, FAA Docket No. 16-07-13 (Sept. 18, 2009) (appeal pending) (concerning allegations of economic discrimination and grant of an exclusive right in connection with airport sponsor’s treatment of larger-class and smaller-class fixed base operators). Kaplan Kirsch & Rockwell represents Westchester County. Final Agency Decision and Order, In the Matter of the City of Santa Monica, FAA Docket No. 16-02-08 (July 8, 2009, Clarified Sept. 3, 2009) (concerning numerous allegations presented by FAA in connection with airport sponsor’s decision to ban certain aircraft in the interest of safety) (appeal pending). Kaplan Kirsch & Rockwell represents the City of Santa Monica. Director’s Determination, JetAway Aviation, Inc. v. Montrose County, FAA Docket No. 16-08-01 (July 2, 2009) (concerning allegations of economic discrimination and grant of exclusive rights in connection with request to lease property for aeronautical use). Kaplan Kirsch & Rockwell represents Montrose County. Final Decision and Order, Air Transport Association of America v. City of Los Angeles, FAA Docket No. 13-95-05 (June 1, 2009) (concerning allegations of revenue diversion in connection with condemnation of property). Director’s Determination, J&B Enterprises, Inc. v. Metropolitan Nashville Airport Auth., FAA Docket No. 16-08-07 (May 5, 2009) (concerning allegations of civil rights discrimination in connection with airport concession program) (on appeal). Kaplan Kirsch & Rockwell represents the Airport Authority. Director’s Determination, Goodrich Pilot Training Center, LLC v. Village of Endicott, FAA Docket No. 16-08-03 (April 3, 2009) (concerning allegations of economic discrimination and grant of exclusive rights in connection with lease termination by airport sponsor). Director’s Determination, Moore v. Sumner County Regional Airport Auth., FAA Docket No. 16-07-16 (Feb. 27, 2009) (concerning allegations of economic discrimination and grant of exclusive rights in connection with airport sponsor’s denial of request to conduct aeronautical activity). EPA, Final Rule, Effluent Limitations Guidelines and Standards for the Construction and Development Point Source Category, 74 Fed. Reg. 62,996 (Dec. 1, 2009). FAA, Passenger Facility Charge (PFC) Program Assurances (Nov. 10, 2009). FAA, Final Rule, Congestion Management Rule for John F. Kennedy International Airport and Newark Liberty International Airport, 74 Fed. Reg. 52,134 (Oct. 9, 2009). FAA, Final Rule, Congestion Management Rule for LaGuardia Airport, 74 Fed. Reg. 52,132 (Oct. 9, 2009). FAA, Technical Report, Voluntary Airport Low Emission Program (Oct. 1, 2009). FAA, Order 5190.6B, Airport Compliance Manual (Sept. 30, 2009). FAA, Notice, Airport Privatization Pilot Program, Notice of Receipt and Acceptance for Review: Preliminary Application for Louis Armstrong New Orleans International Airport, New Orleans, LA, 74 Fed. Reg. 47,304 (Sept. 15, 2009). EPA, Proposed Rule, Effluent Limitation Guidelines and New Source Performance Standards for the Airport Deicing Category, 74 Fed. Reg. 44,676 (Aug. 28, 2009). FAA, Program Guidance Letter 09-01, Eligibility of Wildlife Hazard Assessments (July 17, 2009). EPA, Proposed Rule, Primary National Ambient Air Quality Standard for Nitrogen Dioxide, 74 Fed. Reg. 34,404 (July 15, 2009). FAA, CertAlert No. 09-10, Wildlife Hazard Assessments in Accordance with Part 139 Requirements (June 11, 2009). EPA, Proposed Rule, Mandatory Reporting of Greenhouse Gases, 74 Fed. Reg. 16,448 (April 10, 2009). FAA, Notice of Proposed Rulemaking, Disadvantaged Business Enterprise; Overall Goal Schedule and Substitution, 74 Fed. Reg. 15,910 (April 8, 2009). FAA, Advance Notice of Proposed Rulemaking, Disadvantaged Business Enterprise Program; Potential Program, 74 Fed. Reg. 15,904 (April 8, 2009). Aviation Security: DHS and TSA Have Researched, Developed, and Begun Deploying Passenger Checkpoint Screening Technologies, but Continue to Face Challenges, GAO 10-128 (Oct. 2009). Next Generation Air Transportation System: FAA Faces Challenges in Responding to Task Force Recommendations, GAO-10-188T (Oct. 2009). Aviation Security: A National Strategy and Other Actions Would Strengthen TSA’s Efforts to Secure Commercial Airport Perimeters and Access Controls, GAO-09-399 (Sept. 2009). Aviation and Climate Change: Aircraft Emissions Expected to Grow, but Technological and Operational Improvements and Government Policies Can Help Control Emissions, GAO-09-554 (June 2009). Aviation Security: TSA Has Completed Key Activities Associated with Implementing Secure Flight, but Additional Actions Are Needed to Mitigate Risks, GAO-09-292 (May 2009). Commercial Aviation: Airline Industry Contraction Due to Volatile Fuel Prices and Falling Demand Affects Airports, Passengers, and Federal Government Revenues, GAO-09-393 (April 2009). Aviation Security: Preliminary Observations on TSA’s Progress and Challenges in Meeting the Statutory Mandate for Screening Air Cargo on Passenger Aircraft, GAO-09-422T (March 2009). Next Generation Air Transportation System: Issues Associated with Midterm Implementation of Capabilities and Full System Transformation, GAO-09-481T (March 2009). National Airspace System: FAA Reauthorization Issues are Critical to System Transformation and Operations, GAO-09-377T (Feb. 2009). DHS Office of Inspector General, TSA’s Role in General Aviation Security, OIG-09-69 (May 2009). DOT Office of Inspector General, Actions Taken and Needed to Improve FAA’s Runway Safety Area Program, Report No. AV-2009-039 (March 3, 2009). DOT Office of Inspector General, Letter Regarding Review of DOT and FAA Actions Related to Slot Auctions at New York Airports (Jan. 15, 2009). ACRP Synthesis 17 – Approaches to Integrating Airport Development and Federal Environmental Review Processes (Nov. 2009). ACRP Project Report 18 – Passenger Air Service Development Techniques (Oct. 2009). ACRP Project Report 16 – Guidebook for Managing Small Airports (Oct. 2009). Circular No. E-C138, Critical Issues in Aviation and the Environment 2009 (Sept. 2009). Kaplan Kirsch & Rockwell contributed to this circular. ACRP Project Report 11 – Guidebook on Preparing Airport Greenhouse Gas Emissions Inventories (Sept. 2009). ACRP Legal Research Digest 7 – Airport Governance and Ownership (Aug. 2009). Kaplan Kirsch & Rockwell authored this digest. ACRP Synthesis 16 – Compilation of Noise Programs in Areas Outside DNL 65 (Aug. 2009). ACRP Synthesis 13 – Effective Practices for Preparing Airport Improvement Program Benefit-Cost Analysis (June 2009). ACRP Legal Research Digest 6 – The Impact of Airline Bankruptcies on Airports (May 2009). ACRP Legal Research Digest 5 – Responsibility for Implementation and Enforcement of Airport Land-Use Zoning Restrictions (March 2009). Partnership for Air Transportation Noise and Emissions Reduction, Aircraft Impacts on Local and Regional Air Quality in the United States, PARTNER-COE-2009-02 (Oct. 2009). S. Hu, Aircraft Emission Impacts in a Neighborhood Adajcent to a General Aviation Airport in Southern California, Environ. Sci. Technol. (2009). J. Trock, The Relocation of Panama City Airport: A Model in Airport Development and Community-Based Sustainable Land Use Planning, Air & Space Lawyer, Vol. 22, No. 3 at 14 (2009). M. Hargrove Kemp, Mechanisms for Addressing Capacity-Related Delays at U.S. Airports, 22 Air & Space Lawyer, Vol. 22, No. 2 at 1 (2009).